Serving as a bridge to Kindergarten, the Transitional Kindergarten program at NGFS provides the “gift of time” for younger students to engage in a rich, early educational experience. Students in A Child’s Garden are divided into three groups: Preschool, Pre-Kindergarten, and Transitional Kindergarten. The A Child’s Garden classroom includes developmentally appropriate centers, a circle area with a Smartboard, and a fenced playground with age-appropriate play equipment. In addition to learning alongside their peers in Pre-K, Transitional Kindergarten students build reading, handwriting, and math skills while working with our reading and math specialists. Transitional Kindergarten students build Kindergarten readiness by participating in Morning Meeting with the Kindergarten class one morning a week. In our busy world, finding time for young children to play can be difficult; at our school, it is a priority. The research is plentiful and compelling: Unstructured playtime allows children to create and explore worlds they can master, conquering their fears while practicing adult roles. Play helps provide a balance to a child’s day in which academic, social, and emotional growth can occur simultaneously. As children master their imagined worlds, they develop new competencies that lead to enhanced confidence and the resiliency they will need to face future challenges. 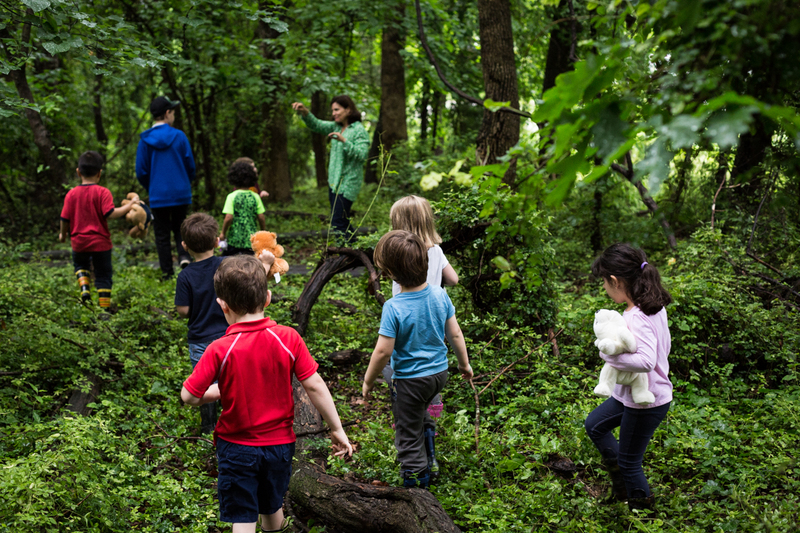 During our daily outdoor time in our fenced play area, which contains gross motor and imaginative play equipment, children often create their own games, playing with natural objects and inventing fun that involves chasing and tagging. These activities provide the opportunity for children to take turns, work with a group of peers, make decisions, resolve conflicts, and create rules. During work at indoor centers, we create similar opportunities by providing materials and structure in an unhurried setting. We see children explore in the direction of their own questions and make creative decisions. In TK we take a multi-sensory approach to both beginning letter-sound connections and letter formation. 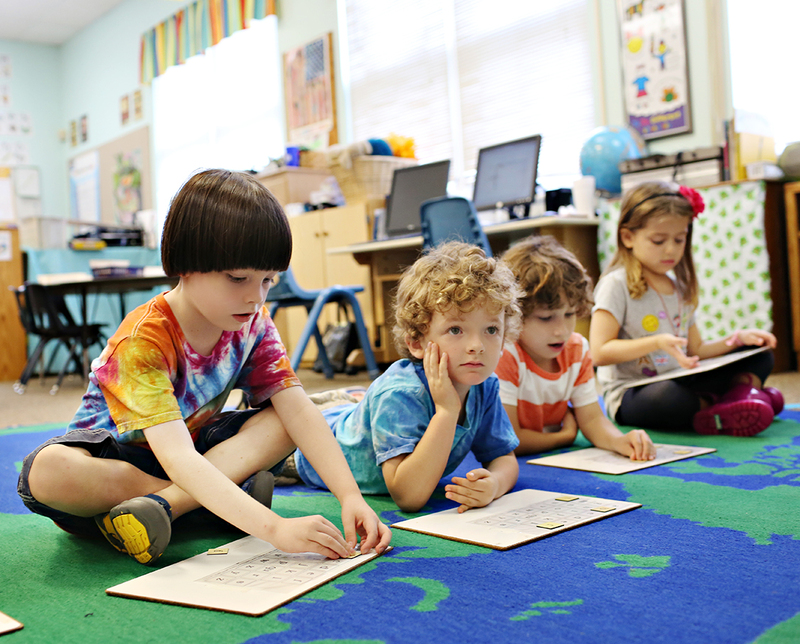 Early reading skills are taught through “Get Set for School”, and the Handwriting without Tears curriculum is used to develop handwriting skills. We introduce”Big Books” and picture books to teach concepts of print. Children begin to understand and appreciate the work of authors and illustrators. Reading in a group setting provides an engaging shared book experience, and we foster comprehension through group discussions. Together, the students begin to use clues from the text and the illustrations to make inferences and formulate predictions. Sorting shapes, patterning, and counting are all activities that develop strong math skills. At NGFS, we take a hands-on approach to math. Using the “Get Set for School” curriculum and manipulatives, we focus on number sense and counting, graphing, geometry, and spatial awareness. The concepts of sorting objects by attributes such as color, size and shape, counting with one-to-one correspondence, identifying and writing numerals, and rote counting are all skills practiced in Transitional Kindergarten. Children also learn to create patterns with objects that have discernible attributes, such as color and size. While our youngest students may not be able to write their stories yet, they all have a lot to say! At NGFS, beginning writing skills are taught throughout the curriculum. Children use drawings to begin to tell their stories. With encouragement from a teacher, they label their pictures with beginning letters and sounds. Reading and writing have a direct connection, and children develop the skill of hearing beginning and ending sounds in words. They begin to apply what they know about letters and sounds to describe ideas in their writing. Teachers encourage and provide support as children tell their stories through pictures, and gradually add more words. Soon they are proudly telling their stories with both drawings and written words. At this age, our students are learning to work and play in a classroom community. In TK children learn to follow class schedules and routines. Through modeling, discussion, and direct instruction, they learn to pay attention to teacher instructions and directions and to participate in group discussions. Conflict resolution is a skill that is intentionally modeled and taught to our TK students. Learning to settle conflicts, first with teacher assistance and gradually without teacher assistance, are skills practiced in TK. The following year in kindergarten, children experience a new and more academically rigorous program. Twice a week, students receive instruction in PE, Spanish, music, and art from teachers with expertise in those curriculum areas.